These are the photo easels I mentioned. You can pick them up for about $4 at Michael's Crafts. I’ve been doing events for ages, and my first few weren’t easy. No one had a must-have list, and I had to learn by doing. Today I’m sparing you all of that. So, here are the ten things every writer should have in his “Traveling Promotional Toolkit” (other than, obviously, your books/product). If you’re with a larger writing promotional organization, such as Broad Universe, there’s a good chance you won’t have to worry about some things on this list, like the table and tablecloths. But you should own them anyway, because at some point, you will probably be going solo. Interestingly enough, these ten items won’t break your bank—in fact, if you buy everything at once, your investment is going to be well under $100 and most of that you’ll never have to replace—but they’re absolutely essential if you’re going to take your show on the road. Table/Chair: Card tables aren’t that expensive. Pick one up and keep it in your basement. If you don’t use it for going on the road, believe me, you’ll find some other use for it the next time you throw a party. A decent card table can run you anywhere from $20 on up. Some come with four or five chairs and start at about $50—but as far as chairs go, anything from home will do. Even those fold-up lawn chairs are fine. But you should have one in case the venue doesn’t. Tablecloth: You can bring a cloth one from home you already own, but since I’m a horror writer I like to get funky and use something appropriate. Plastic tablecloths, which you can get at any party store and start at, like, a buck, are the best choice, because you can customize them to the event (you might not want to bring your blood-spatter design to a hospital benefit, for example), and you can toss them when they get worn out. I usually get several uses out of them and have a few different designs on hand, especially during October, when I’m doing four or five events in a row and want to change it up. You’ll find you also won’t mind loaning out the plastic ones, either. These are the most frequent things you’ll replace other than your handouts (see below). Book Stands: Sure, you can lay your books down on the table, but if they’re standing up, they’re easier to spot, plus they instantly look serious. You don’t have to spend a fortune to own an industrial book stand: these are the poor man’s POP (point-of-purchase) displays. All you have to do is visit Michael’s Crafts and head down the framing/photo aisles; they’re referred to as easels, they’re portable, and they’re cheap. The ones pictured above, which fold easily, are about $3.99 each, and if you get Michael’s coupons in the weekly paper, then they’re even less. If you wanna go nuts, they have some pretty cool wrought-iron ones. Those are on my Christmas list. If you don’t have a Michael’s, craft or hobby stores should carry them. They are also, I think, available through Amazon. 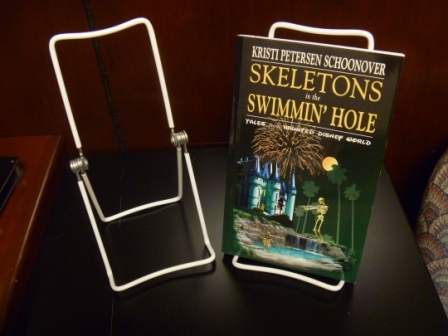 Posted on May 17, 2012, in The Writing Life and tagged book stands, Broad Universe, display easels, how to do a book signing, New England Horror Writers, writing conventions. Bookmark the permalink. 2 Comments. Great, Terri! I’m glad I saved some people all the trouble I had when I first started! Please feel free to pass this around to others if you think it would help them!